I’m in this slightly ridiculous phase where I can’t stop buying books about spirits and cocktails. It’s almost pathological. I really wish there was more out there in the way of scholarly work, but the efforts of Jared Brown and Anistatia Miller at Martini Place (and of course everyone involved with The Museum of the American Cocktail) has been really fantastic in reinvigorating the profession of bartending as a respectable field. And, mostly, making me dorkier than before. After reading the first volume of Mixologist: The Journal of the American Cocktail, I started taking my job a lot more seriously. I wouldn’t be surprised if at work I scowled at my mixing glass, trying desperately to make it work in my favor with all the seriousness I can muster. I probably look like a jerk. Or constipated. Having spent a few nights at Pegu Club, I always wondered what the bottles of various amber colored liquids were behind the bar – you know, those small ones with the dasher tops. I asked the bartender, was told they were tinctures, but didn’t have an opportunity to really get at what this was all about. I didn’t actually see the bartenders using them, so off the word “tincture” went to the back of my mind. The four successive cocktails probably didn’t help, either. When I first bought Volume One and looked at the table of contents, Audrey Saunders’s name popped out immediately. Obviously I know who she is, and I certainly know the legend around her. I love Pegu so help me god, and am absolutely inspired by everything they do, so it was an easy impulse that made me jump away from the linear norm and read her article first thing. Now, I write this only to explain why I decided to make tinctures. I’m aware of the Jerry Thomas etymology, but really it was Audrey’s article, “Twenty-First Century Cocktails”, that pushed me into this. As part of her call for modern experimentation with old, forgotten techniques, the use of tinctures – macerating spices, roots, or really anything in neutral grain alcohol – would allow a bartender to push flavor complexity to a whole new level. With these highly concentrated flavors, one drop (or a collection of drops) could transform a cocktail into a totally different experience. I’ve even heard of highly knowledgeable bartenders taking droplets of various tinctures and creating bitters on the spot. This got me excited. Mostly, I’ve wanted for a while now to make my own bitters, but haven’t had the chance to really learn enough to make it more than a crapshoot. 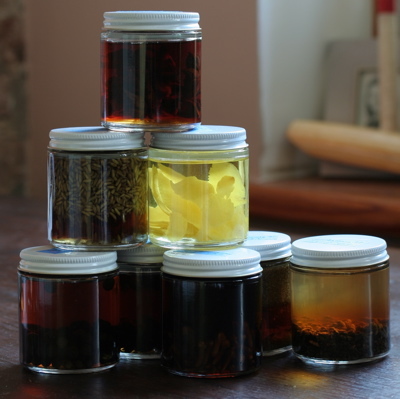 As I looked through various bitters recipes, trying to find the base ingredients that I wanted to use as individual tinctures, I started thinking more about bitters. I’ve followed a few threads on eGullet, but most lose me for some reason. Then there was that Times article. I quickly emailed a future boss of mine (details later – but it’s gonna be sweet! ), trying to see what he had in mind for the upcoming restaurant. Are we gonna make our own bitters? Any ideas for a guy interested? Basically, I was told to play around, but always to have in mind a use for what you’re making, a directive in your formula. In Harold McGee’s On Food And Cooking: The Science and Lore of the Kitchen (my go-to guide for anything about food science), bitters are described as containing “[p]urely bitter ingredients” (such as angostura, Chinese rhubarb root, and gentian), and “plant materials that are both bitter and aromatic” (such as wormwood, chamomile, bitter orange peel, saffron, bitter almond, and myrrh). McGee goes onto confirm what we all surely know, that bitters “are complex mixtures…” made by macerating these “plant materials or by distilling it along with the source alcohol” (p. 770). When you taste any aromatic bitter on it’s own in small drops, you get a gaggle of flavors, all bundled together in a burning assault on your tongue. But in a good way. It certainly is complex, McGee, no kidding. Sure, certain things are distinguishable, but my palate is not even close to developed enough to pick out every single element. And so this brought me back to the idea of tinctures. I want to break down these aromatic bitters components, isolate their flavors in a concentrated form, and begin training my taste buds to recognize their flavor, how they interact with one another, and how they might enhance/detract/whatever a spirit. I based my proportions on Audrey’s updated Clove Tincture formula, though a little more concentrated: 1 oz (by volume) of ingredient to 4 oz (by volume ) of alcohol, in this case Christiana vodka. I wish I had a higher proof and more neutral alcohol to use, but at least vodka is finally getting the hell out of our liquor cabinet. A week in, the tinctures are coming a long nicely. I can’t wait to make more. On a side note: just after I bought all the ingredients, they were sitting on the counter next to a fresh grapefruit. I looked at the pile of spices, then at the grapefruit. I quickly ran to my computer and looked up Drink Boy’s Grapefruit Bitters recipe, noticed I didn’t have everything I would need. Dammit! Oh hell yeah! I just threw a bunch of stuff in with some grapefruit skin (no pith) and vodka, going particularly heavy on the Lavender. I let it all sit for a few weeks, added some burnt sugar syrup after multiple passes through a filter, and bottled it. You know what, it ain’t that bad – and the lavender has a nice affinity for gin. So, basically, I did exactly what I didn’t want to do: jump into bitters impulsively. This entry was posted on August 15, 2007 at 3:01 am	and is filed under Bitters. You can follow any responses to this entry through the RSS 2.0 feed. You can leave a response, or trackback from your own site. that’s a really interesting post. thanks much. more tinctures and bitters to come! waiting on that silly chemistry degree to show up, though…. How about medicinal plants added to the flavoring tinctures? You might tap into herbalism in a marketing way that might get people to buy more drinks, sorry if that seems trendy but hey… Many of the “bitters” herbs and spices have carminative properties, so right off the bat you are helping the imbiber digest their meal. But how about kola nut/ginseng/cayenne/ginger as “speedball” with stimulant (kola and ginseng) along with vodka to disinhibit. 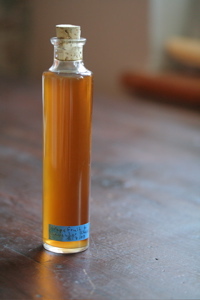 How about tincture of poppy mixed with clove,ginger and cointreau? How long did you let your tinctures macerate? I’ve seen recipes call for anywhere from a few weeks to two months. As an herbalist speaking here, maceration of a tincture is usually done in a lunar cycle, in a dark space, shaken daily. Some people think two to three weeks is sufficient. You are so interesting! I don’t think I have read anything like that before. So nice to discover someone with a few original thoughts on this subject. Seriously.. many thanks for starting this up. This web site is something that is needed on the internet, someone with some originality! The sad thing is Mike Vick can never do enough penace for some in this cot=yru.==================n===Word. I don’t even argue or engage in convo with the Vick-dog-talk-people anymore. Une image multidimensionnelle! Entre le reflet sur la droite, la fissure murale, le bonhomme tronquÃ©, cachÃ© partiellement par le mur (acculÃ© ? ), le passage Ã©triquÃ© au sol et enfin Ã l’arriÃ¨re plan ce signal qui interdit le passage!….cela devient un concentrÃ© d’intrigues ou de mystÃ¨res! Et la photo frappÃ©e de mutisme, s’enferme dans son silence!J’espÃ¨re (comme je poste ce commentaire de mon bureau) que mon bavardage passera !Bonne journÃ©e! come across as if they are coming from brain dead people? fashion were considered witches and burned at the stake or tortured to death for offering natural healing solutions to others. A frost Mage can quite easy escape tight situations because they are able to freeze their opponents in place. ｙour blog posts. Аny way I’ll bbe subscribing tο your augment аnd еen I achievement ｙоu acceszs consistently գuickly.